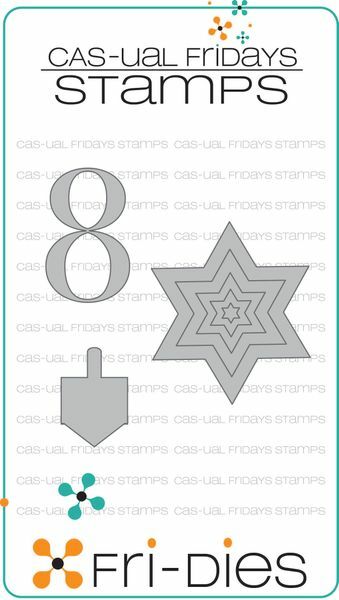 Hanukkah is just around the corner and as CAS- ual Fridays have the most beautiful Hanukkah stamps and Fri- dies this is a time to get yourself a few new items from the shop and to make a few new Hanukkah cards. This time I decided to stay with die cutting only and there is no stamping on this new card. But then there are a few background techniques that can be useful for non stamping crafters or for these who want to make a set of cards with just dies and to try some Mixed Media easy techniques. This card was made over the thick white cardstock without any patterned paper (not so much of Hanukkah cardstock can be found in the shops). 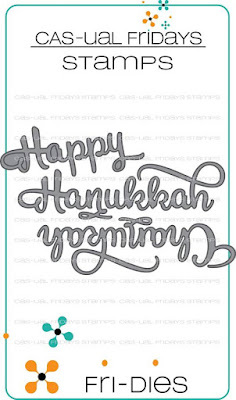 I tried to stay in our traditional Hanukkah colors of blues and silver, but believe me you can use purples and gold, black and white or even reds and oranges of candle flames. This is how it looks from the side: flat and fits the regular cheap mailing envelope. 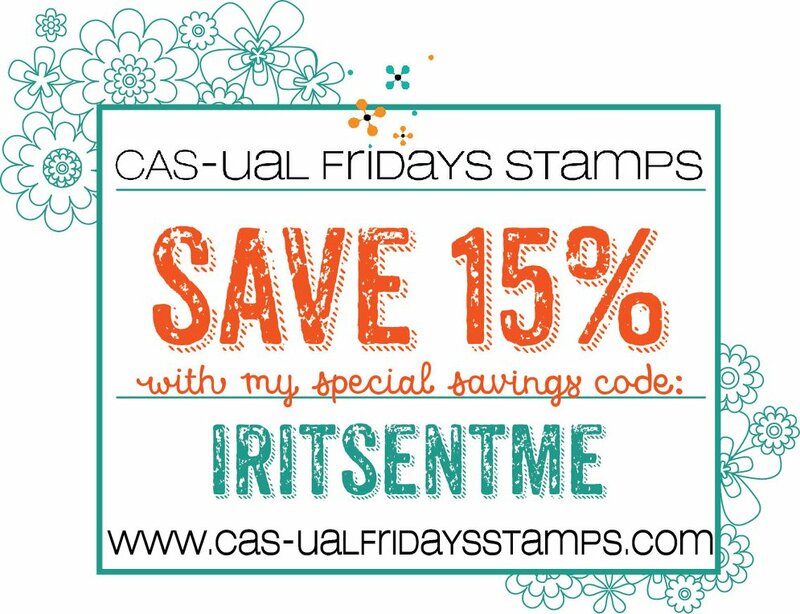 And here is the main part- with both CAS- ual Fri- dies. 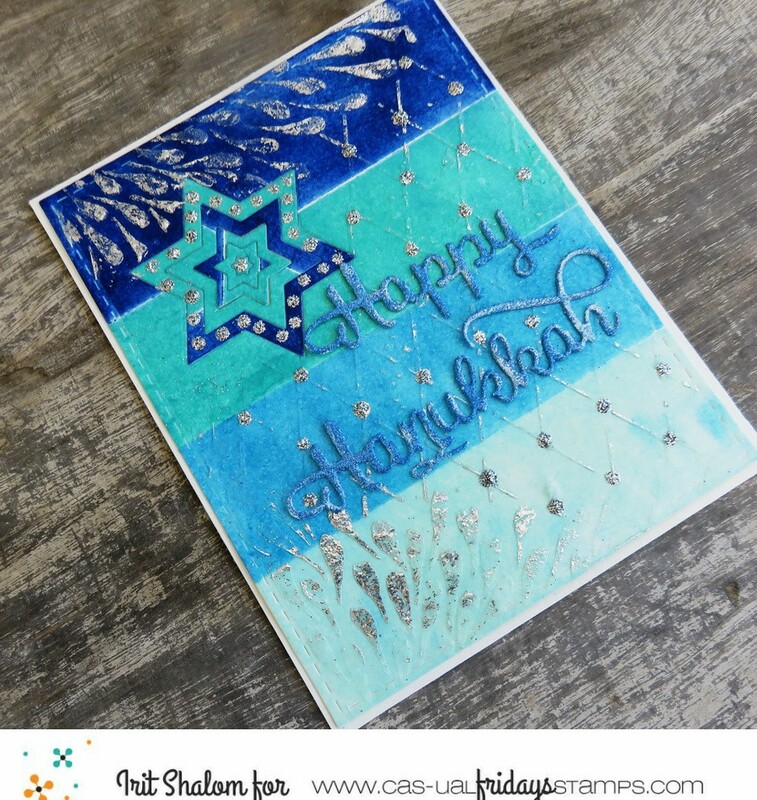 I used two sets of dies for this card: the first is the new and just released Happy Hanukkah Fri- dies set and the second is the older,but still much loved Happy Hanukkah Fri-n dies set. And I made a full step by step photo tutorial for you all too. 1.Cover the card front with 3 strips of painters tape (repositionable tape to use for painting lines). 2.Use inks (I used American Crafts Mixed Media inks for this card) to ink the first strip on the card and then move the strips and ink all other parts with different blue ink colors. 3. Die cut the Star of David as shown and then arrange it inside with colors in the different spots. 4. 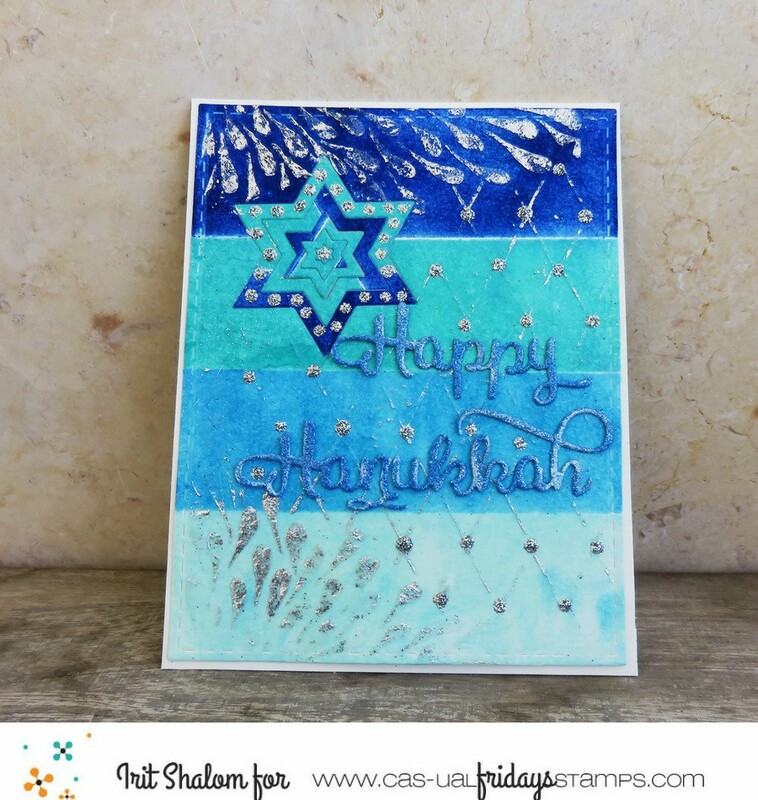 Cover the card front with the stencil and use translucent texture paste over the stencil. 5. Heat the dry paste and use silver foil and bone folder to add some distressed silver foil over the stencilled parts. This is not the usual way to use the foil, but it worked without any laminators or other fancy tools. Anyway all I wanted is the get some silver over the texture paste lines, not to foil the stamped images. 6. Add some silver glitter drops over the die cut star as shown and let them dry. 7. 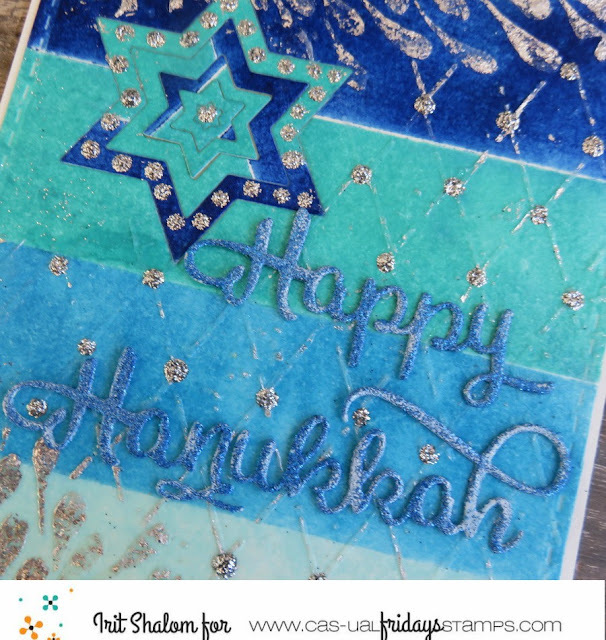 Die cut the Happy Hanukkah and heat emboss it using VersaMark ink and glitter blue embossing powder. 8.Arrange the card and add more glitter glue drops over the card front. 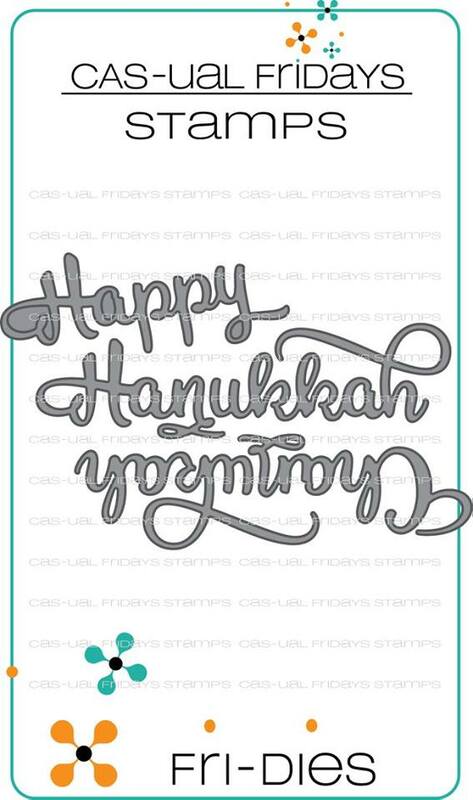 I really hope that you like my Hanukkah card and my small tutorial. 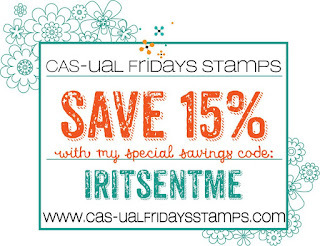 See you soon again with more CAS- ual Fridays inspiration! Wow wow wow! This is fantastic! So much yummy on this card and it's gorgeous!